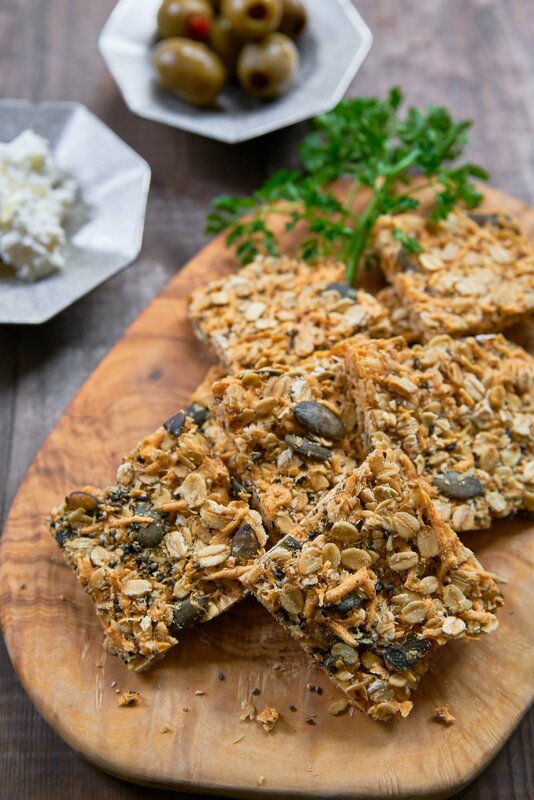 With crunchy rolled oats, pumpkin seeds, chia seeds, and sesame seeds held together with crisp Cheddar and Parmigiano-Reggiano, these cheesy, savory granola bars are as satisfying as they are delicious. I love cheese and whether it’s real cheese, or cheese flavored things I find it hard to stop eating them once I start. Cheez-Its (and the Japanese equivalent Cheeza) are a particular weakness of mine, and it’s not a stretch to polish off an entire bag in one sitting. While they’re not quite as junky as some snacks, they’re not exactly wholesome either. This is where I got this crazy idea of making these granola cheese crackers. It may sound a bit weird at first, but there’s nothing new about savory granola, and by adding enough cheese, it not only gives these a blissfully cheesy flavor, but it also holds them together. They’re as cheesy as Cheez-Its but with a texture that has multiple layers of crunch. The first layer comes as you bite into a piece and the crisp cheese gives way, crumbling into the constituent components. Chewing gives you the crisp crunch of the rolled oats and the supple crunch of the pumpkin seeds. As you continue to chew, the crisp chia seeds pop in your mouth followed by the sesame seeds, which burst with nutty flavor. While the fireworks display of textures is going off in your mouth, the cheese flavor crescendos from mere aroma to a full onslaught of cheesy goodness. Needless to say, these have now been added to the snacks we keep around the house. So here’s how I made them. 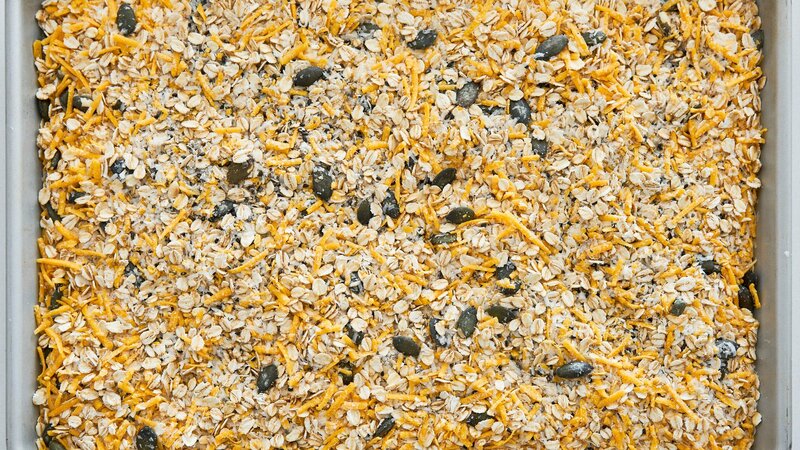 Filler – Usually this takes the form of rolled oats combined with other things such as nuts, seeds, coconut, bran, etc. Binder – This is what helps hold everything in the filler together to form clumps (or bars). In the case of sweet granola, this is usually sugar or syrup. Flavoring – This is what gives the granola flavor, such as dried fruit, extracts (vanilla, almond, orange, etc), and powders (cocoa powder, strawberry, etc). Additionally, there is usually some oil added, such as butter or coconut oil, which helps the filler ingredients brown more evenly, enhancing their flavor. 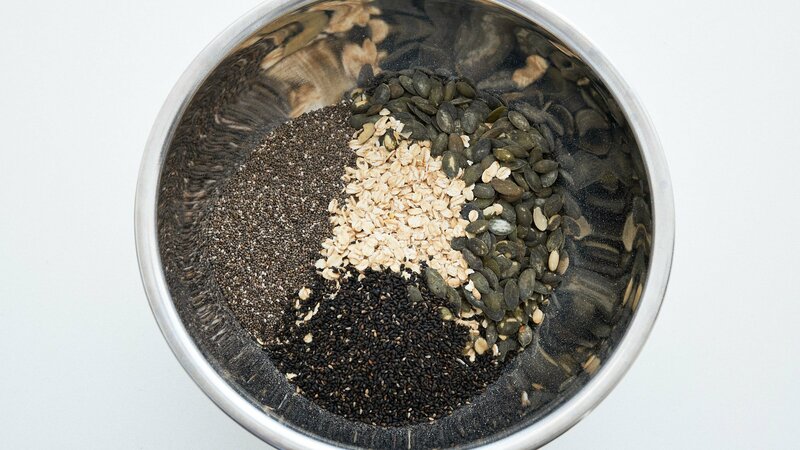 For my savory granola, I used a base of rolled oats mixed with pumpkin seeds, chia seeds, and black sesame seeds. 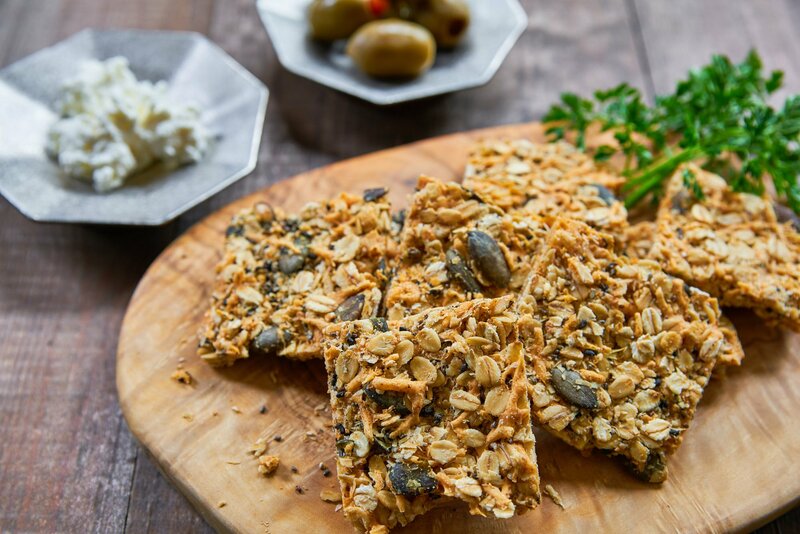 These wouldn’t be out of place in sweet granola, but I thought the smoky pumpkin seeds and nutty sesame would play nicely with the cheese. You could have a lot of fun here and adapt the filler ingredients depending on what you have in your pantry at the moment. I waffled back and forth on how to bind my savory granola. One option I considered was using egg whites, but I wanted an ultra cheesy flavor and figured if I added enough cheese, it would crisp (like the crispy cheese you get on the edges of a grilled cheese sandwich) and hold the whole thing together. The cheese is not only the primary flavoring for this granola, but it also serves as a binder. As a bonus, cheese has a ton of oil, so the granola will brown and crisp evenly without adding any additional oil. The first time I made this, I used a 50:50 mix of Cheddar and Parmigiano-Reggiano, but the problem is that Parmigiano-Reggiano is a dry cheese and does not melt as Cheddar does. This means it doesn’t bind the ingredients together very well, and the bars fall apart easily. I ended up increasing the amount of Cheddar to compensate, which gives it the perfect balance of cohesiveness and flavor. If you substitute other cheeses, be sure to use enough cheese that melts (e.g., Cheddar, Gruyere, Comté, Emmental, Gouda, etc.) so that everything holds together. I also wouldn’t recommend using a soft cheese such as camembert or brie because their water content is too high. Once baked, the cheese melts and crisps, holding the whole sheet pan of savory granola together. It’s still a little malleable while hot, so this is the time to shape it how you want it. If you want clusters, you can break the sheet up with your hands (be careful not to burn yourself). You can also use a knife to cut the sheet into rectangular bars, square crackers, or triangles. They’re edible as soon as they cool, but I’ve found that they taste better after resting for at least a day; this allows for a more robust cheese flavor to develop. It also makes them a perfect make-ahead snack for parties and potlucks. 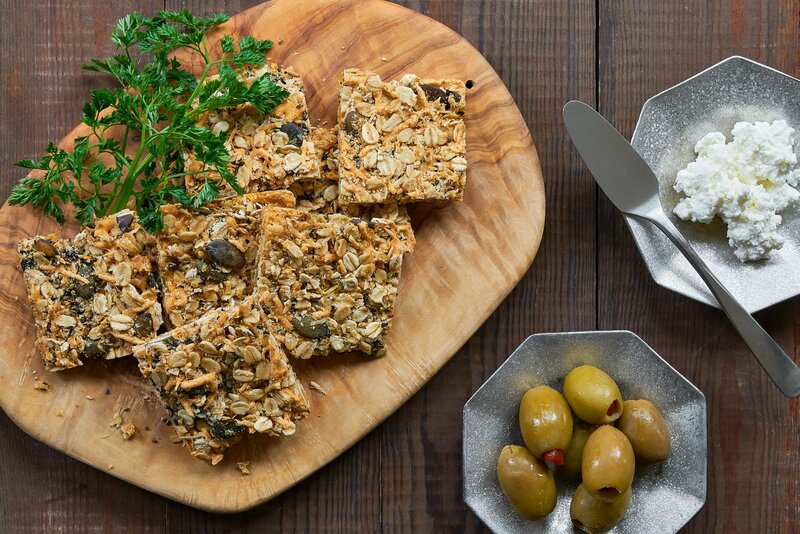 These cheesy granola crackers make for a delicious yet wholesome snack as is, but they can also be used as a base for something fancier. Spread a little honey ricotta on top and garnish with edible flowers for a canapé, or just top with some fig preserves for a sweet and savory snack. The savory granola crumbles left over when you slice them is the perfect topping to add a bit of texture to salads and pasta. Finally, I haven’t tried this yet, but I’m wondering if these could be turned into a savory granola crust for quiche, or a savory cheesecake. If anyone tries this, I’d love to hear how it goes in the comments. In a large bowl, toss the rolled oats, pumpkin seeds, chia seeds, sesame seeds, smoked paprika, onion powder, and garlic powder together. 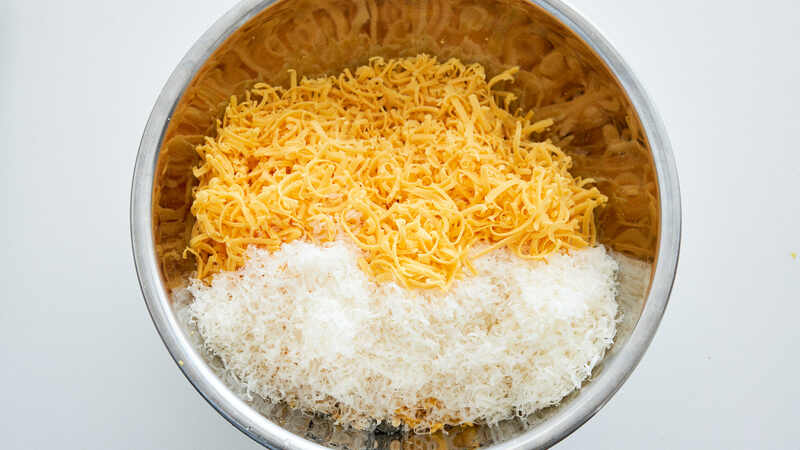 Add the Cheddar and Parmigiano-Reggiano to the mixture and toss to coat evenly. Spread the mixture onto a non-stick jelly roll pan (10.5 x 15.5 inches) and press down to make everything stick together. Bake for 30-35 minutes or until the cheese has crisped and the granola is golden brown. Remove the pan from the oven and while the granola is still hot, transfer it to to a cutting board and cut into squares or bars. Let them cool completely and store in an airtight container. 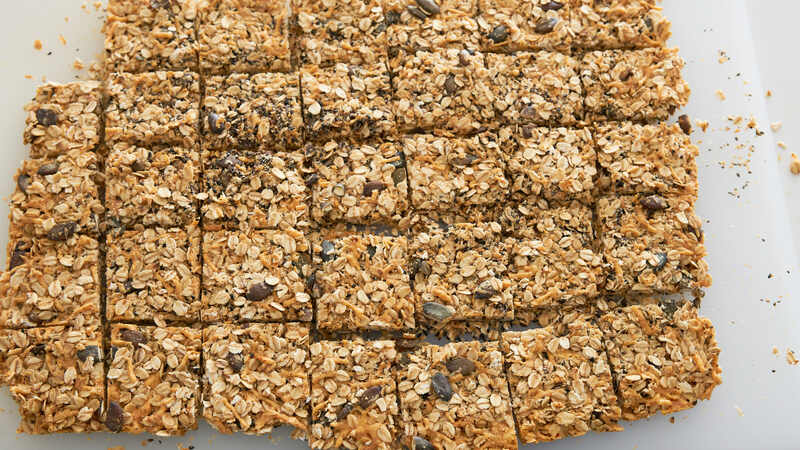 These savory granola bars taste best when left to rest for a day or two.